CD available for post-free online mail-order or you may download individual tracks. For some labels you can download the entire CD with a single click and make HUGE savings. The price you see is the price you pay! The full booklet notes are available on-line. NOTE  Click on the button and you can buy the disc or read the booklet details  You can also access each track which you may then sample or down load.  Further Information. 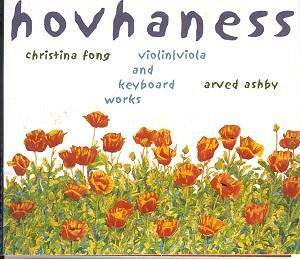 The third in a series featuring previously unrecorded works for violin/viola by well-known composers, this CD contains several world premiere recordings of Alan Hovhaness's works for violin/viola and keyboard. Glenn Freeman's Ogre/Ogress have not sold out to easy commercial conformity. The evidence is a stream of highly idiosyncratic releases in which Freeman and the violinist Christina Fong have exhumed and 'recreated' works by John Cage, Morton Feldman and now Hovhaness. That they care about, and for, the works is never in doubt. Fong is here joined by Arved Ashby who also wrote the liner note. Fong switches from violin to viola as the pieces dictate and Ashby likewise between piano and harpsichord. The recording is warm, honeyed, close and enveloping - quite distinctive. This disc contains the composer's complete output for unaccompanied violin and viola and his complete published works for violin or viola and piano or harpsichord. The pieces are arranged in chronological sequence from the dervish-spinning Varak following the deep mahogany viola 'voice' of the 1922/26 Lullaby. The latter has a touch of Cyril Scott's miniatures and of the Bax Legend with which it is virtually contemporaneous. Chahagir is an unaccompanied viola meditation with effortfully intense double-stopping typefied by the Bach Sonatas and Partitas. Saris, a substantial pillar of music, was written a year after the end of the Second World War; its song is strummingly melancholic. Shatakh (violin and piano) delights with raindrop figuration from the piano floating the violin's oriental melisma. Do not look for great dramatic incident in this music for these are works of modest contour, daring in their way, full of intrigue rather than climactic oratory and turmoil. Yeraz for unaccompanied violin leads us back through tranquil roads to that elusive place of Bachian repose. The Khirgiz Suite (violin and piano) is in three sections; the first two named and the third not. The Variations (I) approximate to a middle eastern Lark Ascending while the chattering Khirgiz Tala (II) is folksy with that sense of slippery ecstasy to be found in the Great War chamber music of Herbert Howells. The unnamed III is gripping and fast music written for virtuoso treatment ... which is what it gets. This recalls Bartók in barbarous mode. The three movement 1954 Duet for violin and harpsichord is very short indeed - just over three minutes and just three movements. The style is radically at odds with the other works with dissonance and discontinuity firmly embraced within a baroque casing. Saint Mesrob invented Armenian script and liturgy. The Three Visions are titled Celestial Mountain (Mountains and Heavenly themes are not unusual titles for Hovhaness), Celestial Bird and Celestial Alphabet. In Mountain and in Alphabet there is dissonance in the plangent depth-drowned/warmed piano part while Bird can be likened to the Tala of the Khirgiz Suite. It is to be regretted that there is a failure to indicate which work is for which instrumental combination. It is also a great pity that the composer's widow, Hinako Fujihara was unable to permit the recording of the composer's unpublished works for accompanied violin or viola. Those readers who heard the recent (Jan 2002) series of five Hovhaness programmes when the late composer was finally given the 'Composer of the Week' treatment on BBC Radio 3 will need no second bidding. A serious but always emotionally endearing recital wonderfully put across by Fong and Ashby. You require QuickTime to listed to samples. ADDITIONAL INFORMATION  You can sample only 30 seconds (or 15% if that is longer) of a given track. Select from the View tracks list. Each sample will normally start from the beginning but you can drag the slider to any position before pressing play.  PLEASE NOTE: If you are behind a firewall and the sound is prematurely terminated you may need to register Ludwig as a trusted source with your firewall software. You will need Quicktime to hear sound samples. Get a free Quicktime download here  If you cannot see the "Sample All Tracks" button you need to download Flash from here.